(July 17th, 2018. SARASOTA, FL) — MCT Law attorneys negotiated a $101 million settlement for an infant who suffered a severe reaction to the MMR vaccine. O.R. * was a one-year-old healthy baby girl who was already walking and climbing. On February 13, 2013, she received vaccinations for Measles Mumps Rubella (MMR), Hepatitis A, Haemophilus Influenzae type B (Hip), Prevnar (pneumonia), and Varicella (chickenpox). That evening, the mother noticed baby O.R. was irritable and feverish. After a call to the pediatrician, the doctor advised Mom to give her Tylenol and Benadryl. The fever continued for several days and on the evening before her scheduled pediatrician visit, O.R. began having severe seizures. She was rushed to the emergency room. Baby O.R. went into cardiac and respiratory arrest and doctors placed her on a ventilator. The $101 million-dollar settlement pays for the child’s constant high-level medical care needed for the rest of her life. The family received a lump sum of $1 million dollars to cover the immediate costs of medical bills and expenses. The rest will be paid out through an annuity over the child’s lifetime. Our Attorneys Have Won Millions of Dollars For Our Vaccine Injured Clients. Attorney Diana Stadelnikas represented the child and her parents in the National Vaccine Injury Compensation Program. Ms. Stadelnikas is an experienced Vaccine Injury Attorney and also a former Registered Nurse. She filed a claim with the Vaccine Court on behalf of O.R. alleging the MMR immunization triggered the severe, but rare, reaction. Stadelnikas filed the case in the U.S. Court of Federal Claims against the Secretary of the Department of Health and Human Services (HHS). Upon reviewing the records and evidence, HHS conceded the case and agreed that O.R. was entitled to compensation for her vaccine-related injuries. The $101 million dollar settlement will pay for O.R.’s constant medical care for the rest of her life. The family received a lump sum of $1 million dollars to cover the immediate costs of medical bills and expenses from when the injury first happened. The rest will be paid out through an annuity over the child’s lifetime. 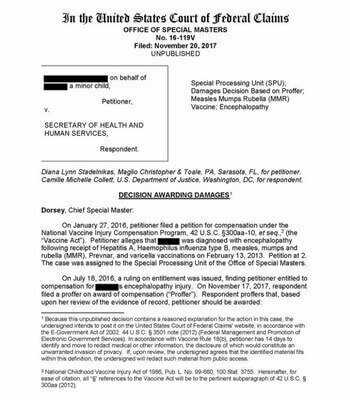 Attorney’s fees and costs are paid by the Vaccine Injury Compensation Program separately from the money awarded to the child. You can download a copy of this vaccine injury case here. Thankfully, this family reached out to our vaccine injury team and we were able to help them, says attorney Diana Stadelnikas. Vaccine injury cases are medically and legally complex; I cannot stress enough how important it is to work with an attorney who has experience representing injured families in the Vaccine Program to successfully navigate the complexities, urges Stadelnikas. The outcome here was a result of hard work, devotion and the collaborative efforts of our experienced team. The attorneys at Maglio Christopher & Toale, P.A. have extensive experience representing people in the National Vaccine Injury Compensation Program (NVICP). For almost 20 years the lawyers at our firm have helped people in all 50 states file vaccine injury claims. We have offices located in Washington, DC, Sarasota, FL and Seattle, WA. Our DC office is located two blocks from the Vaccine Court. In 1986 the federal government set up the National Vaccine Injury Compensation Program. This way, the government may compensate the small percentage of people who experience rare and severe vaccine reactions. As of June 2018, the program trust contains over $3.75 billion dollars to compensate patients who experience adverse vaccine reactions. List of compensation amounts, vaccines, and types of injuries.